Creatures of the Wind is a super artistic fashion brand that designs beautiful garments featuring graphic patterns and bold colors, so it comes as no surprise that their Spring/Summer 2014 collection was accentuated with vibrant, colorful makeup by NARS. If you love this fresh-off-the-runway look from New York Fashion Week, we’ve got the complete product breakdown directly from the brand’s makeup team. “The real statement of the makeup look is the satin textured orange lip,” explained James Boehmer, NARS Director of Global Artistry. The fun makeup definitely plays up the fun nature of the collection! To get this ethereal look, the makeup team used the NARS Radiant Cream Compact Foundation and the NARS Stick Concealer to create an absolutely perfect complexion. For the opalescent green eye, the team used NARS Iceland Duo Eyeshadow. The shimmering green also acts as an eyeliner, giving eyes a radiant glow. On the runway, the team skipped eyeliner and mascara – a surprising trend that has been popping up for dramatic effect on runways for a few seasons now. To transition the look into everyday life, stick to what you’re comfortable with! 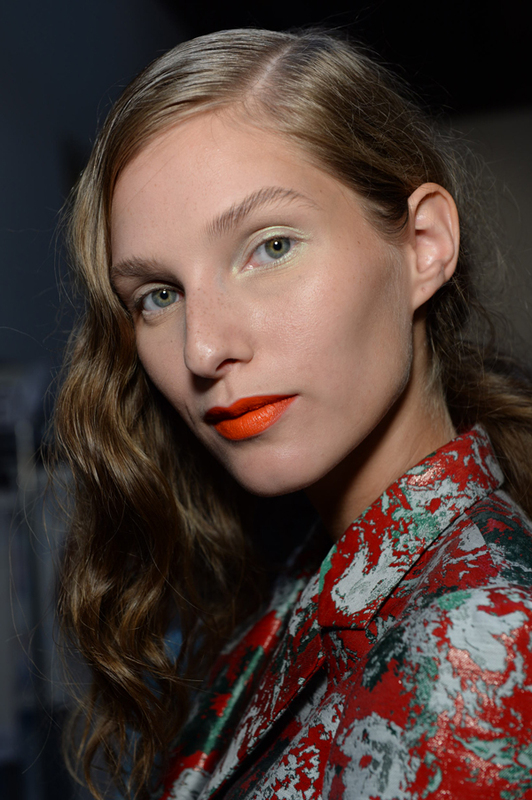 On the models’ lips, the team debuted a new Spring 2014 product from NARS: the Timanfaya Satin Lip Pencil. The punchy color is definitely the star of the makeup look! To get the look right now, try NARS Heat Wave Lipstick with NARS Triple X Lip Gloss. The makeup artists outlined the lips with NARS Red Square Velvet Matte Lip Pencil for extra definition. What do you think of the look? Is it one you’re willing to try out in the spring? Love this fresh, natural look.